The current slogan of the NASCAR XFINITY Series presents the division as the stock car racing equivalent of Triple-A baseball or the NBA D-League, a place where up-and-comers vie for a chance at the majors. But the XFINITY Series differs from its stick-and-ball equivalents in one important way: it allows elite drivers to race against the less-experienced series regulars. On paper, this doesn’t sound like such a bad idea. Since the XFINITY Series runs different cars from Sprint Cup and under different rules, drivers from both divisions have to contend with different types of inexperience. As the cream of the XFINITY crop contends for wins against the Cup invaders, the other regulars benefit by being able to follow in the tire tracks of their Cup rivals. It’s debatable if this format worked in the past. But it’s undeniable that it’s not working now. Most of the XFINITY Series regulars only see the Cup guys for a few moments each race - first when they open up a lead, then when they come around again to put them a lap down. This is the sad reality for nearly three-quarters of the field, ranging from longtime team owners Johnny Davis and Jimmy Means to start-ups like Obaika Motorsports. For these teams, a 15th-place finish is often the best they can expect at most tracks where Cup guys show up to compete. Despite their consistency and persistence, many of these teams struggle with sponsorship and have to “start-and-park” backup cars just to make ends meet. Even family-owned RSS Motorsports, whose driver Ryan Sieg has worked wonders with virtually no funding, still loses laps to Cup regulars. Meanwhile, the slowest of the XFINITY drivers, including veterans like 74-year-old Morgan Shepherd, pull out early most every week. The situation isn’t much better for XFINITY regulars who signed with Cup teams like Joe Gibbs, Richard Childress, and Roush-Fenway. The “battles” between Kyle Busch and Brad Keselowski against Daniel Suarez and Darrell Wallace, Jr. are lopsided at best and unfair at worst. In the Sprint Cup Series, a Top 5 or a Top 10 is a tremendous accomplishment, especially if earned by a new face. But, despite the advertising, that simply isn’t the case in the XFINITY Series. Top-tier series regulars are expected to win by their teams and sponsors alike, and to race at the same level as their Cup counterparts. After all, to a sponsor, if their driver is being supported by a team that contends for wins regularly in Cup and can’t win, then the weak link must be the driver, right? What happens too often is the Cup team gets impatient, and the new driver loses his ride to the next guy in line. Landon Cassill was once a development driver for Hendrick Motorsports while Josh Wise filled out the schedule for Danica Patrick at JR Motorsports. Both achieved modest results, but lost their rides in short order, leaving them to run “start-and-park” efforts in Cup for Max Q Racing and Front Row Motorsports, respectively. It has taken both Cassill and Wise more than five years to climb the ladder once more, and though they now run full-time in Cup, both still race with limited funding. The sad part is that Cassill and Wise are the lucky ones. Consider Danny O’Quinn, Jr. and Todd Kluever, both development drivers for Roush-Fenway Racing who were each released in 2007 after a season and a half on the tour. Just two years after their release, O’Quinn could only get a ride parking XFINITY cars for D’Hont-Humphrey Motorsports while Kluever, once in position to edge David Ragan for Mark Martin’s Cup ride, had disappeared altogether. The turnover rate in the XFINITY Series - especially for the sport’s biggest teams - is now so fast that many drivers are released before they’ve really had a chance to take advantage of the opportunity. Names may be made in the XFINITY Series, but they can be forgotten just as quickly. The simplest solution to fix all this is to bring the XFINITY Series in line with other minor league sports: keep the top athletes out and let the series regulars give the division an identity of its own. But anyone who suggests this is invariably shouted down by drivers, teams, media, and fans alike. This remains the most frustrating and befuddling aspect of the entire controversy: the belief there isn’t one at all, despite so much evidence to the contrary. What perplexes me the most is that many of the most vocal opponents are also those who despise “start-and-park” drivers, claiming that they are undeserving of what little purse money they claim. They refuse to see the Cup invaders as the true cause of the XFINITY Series' woes; “start-and-win” drivers who are all but assured victory - and the majority of the purse - before the race even starts. Sure, we all want to see the stars of the sport, but that’s why we have elite divisions in the first place. It’s no fun to watch one Cup driver run away with a race - we want to see them race against their peers for the biggest prize. If the XFINITY Series’ brand of athletic perversity is okay, then why doesn’t Stephen Curry shoot 3-pointers over the heads of a D-League NBA team? Why doesn’t Madison Bumgarner pitch fastballs past a Triple-A batter? Why, then, do so many think nothing of it when Kyle Busch leads 199 of 200 laps of an XFINITY race? At first, Meier’s final point makes sense. In order to compete in the XFINITY Series, an up-and-coming driver needs a team to give him a car, and that doesn’t just happen on its own. To field an XFINITY car, the team needs to sign a sponsor. But his logic breaks down from there. Simply put, there’s no clear causal link between a Cup driver running in the XFINITY Series and an up-and-coming teammate getting sponsorship of his own. In other words, what exactly “entices” a sponsor? Perhaps Meier means the Cup driver’s performance will endear the Cup driver’s sponsor to the team, and the sponsor will then want to fund the up-and-coming driver in other races. The problem with this racing version of “trickle-down economics” is that it’s not a given that a sponsor who funds an XFINITY Series team will be able to spend more on that team. A number of XFINITY Series team sponsors are only there because it’s a more affordable option than Sprint Cup: a multiple-race deal in XFINITY may only cover one or two races in Cup. It’s misleading to tell an up-and-comer there will be funding for him if he just lets the Cup guy use it first. Further, a sponsor’s loyalty to a driver and a sponsor’s loyalty to a team aren’t the same thing, and having one doesn’t guarantee the other. In both Cup and XFINITY, sponsors have followed a driver from one team to the next. For example, when Justin Allgaier was released from HScott Motorsports, sponsor Brandt came with him to JR Motorsports, and Clint Bowyer filled Allgaier’s spot with his own sponsor, 5-Hour Energy, freed from the closed Michael Waltrip Racing. Or maybe Meier is instead saying the Cup driver’s performance will yield such a big return on the sponsor’s investment that other sponsors will sign with the up-and-coming driver simply because he’s on the same team as the Cup driver. This again assumes that sponsors care more about teams than drivers, which isn’t always true. It also assumes sponsors will act against their own interest. Just because the XFINITY Series is supposed to promote new talent doesn’t mean the sponsor has to agree to do so. It’s far more likely that other sponsors will see a Cup driver’s dominance in an XFINITY race as a sign they need to sponsor him and not the new guy. As businesses, sponsors are mindful of risk, and at the end of the day, the sponsor wants the biggest return it can get - the return they are certain to get with an established Cup star. By allowing a sponsor to fund a Cup driver in XFINITY, the teams create the very problem that makes it so hard to fund up-and-comers in the first place. On the other hand, maybe Meier isn’t saying there’s a link at all. Maybe he means that when a Cup driver runs in the XFINITY Series, he is vouching for the up-and-comer. Here, the chain of causation completely falls apart: why is it that the best way a Cup driver can vouch for an up-and-comer, and thus get that new driver sponsorship, is to race in the XFINITY Series himself? Why can’t he just broker a sponsorship deal back at the shop, then step aside on race day? When interviewed about his dominant 2006 XFINITY title, Kevin Harvick pointed to the sponsors themselves, saying that the sponsor signs with expectations, and that those expectations include races where the Cup driver competes in XFINITY. But where do those expectations come from? They don’t come from nowhere - they’re negotiated by both the sponsor and the team. Both sides have a say in what the money will be spent on. As vital as sponsorship is to a race team, I just don’t buy that the team doesn’t have bargaining power of its own. In reality, a Cup driver has never been required to run XFINITY on an up-and-comer’s behalf. It’s just been so commonplace for so long that it feels like there’s a rule where none exists. Even if there was a link between Cup drivers running XFINITY and up-and-comers getting sponsors, Brad Keselowski and Martin Truex, Jr.’s XFINITY Series experiences aren’t the best examples. 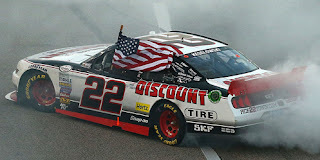 Keselowski and Truex’s XFINITY Series careers were exceptional in that they both raced for and received support from Dale Earnhardt, Jr., the sport’s most popular driver. The name - not the fact that name ran XFINITY races for them - was what got them through the door. Keselowski, to his credit, points this out. Mind you, there’s nothing wrong with this in and of itself - everyone’s been hired based on a recommendation, myself included. And getting a high-powered recommendation is something to be congratulated for - they’re not easy to get. And that’s exactly the problem. They’re not easy to get. There’s just one Dale Earnhardt, Jr., and only so many rides and sponsors he can help drivers secure. It’s naive to think that any other driver - much less any team - has the same pull to help up-and-comers. It's just not an option for the vast majority of the field. The proof is in the series itself, and the widening disparity between the haves and have nots. But still, many just refuse to acknowledge the problem. I’m not saying that the XFINITY Series needs to be a completely level playing field. It's impossible. Racing, after all, is a competition, and some teams and drivers are going to have more resources, bigger sponsors, more success, and just plain better luck. I’m not even saying that Cup teams don’t have a right to be in XFINITY. Every business needs to diversify to survive, and teams have an important interest in developing talent. But letting the Cup Series drivers bludgeon the XFINITY regulars week after week does nothing to help the teams, the sponsors, or the sport. When a Cup driver takes the win and the headlines, it hides the accomplishments of the series regulars and dooms them to remain second-class citizens in their own division. The result is a poor racing product with no identity or purpose of its own. It’s unsustainable, unwatchable, and long overdue for a major overhaul. The most hilarious defense is when someone says that the younger drivers "learn" from racing against the Cup drivers. Yeah, sure, if you're driving for a Cup owner alongside a Cup driver. But, if you're driving for some back-of-the-pack team that can't put two beans together, it doesn't make a difference. NASCAR banning Cup drivers from the lower series might not go over well in the short-term, but in the long run, the future quality of the sport would be a thousand times better. Otherwise, pay drivers will be the name of the game from here on out. Mark Martin was the one who started that. He went full time Cup in 1988 but continued racing in at least half the season's Busch series races from 1988 until the year 2000. Mark won 42 Busch series races during that 1988/2000 time period and was racing full time Cup and winning there too. He ended up with 49 Busch series wins which he thought would forever be something never equaled because he was the only one doing it at the time. It wasn't Mark's sponsor that wanted him to do that, it was Mark himself who wanted to rack up those easy wins. Then along came Kyle Busch and it was Kyle's sponsor's who wanted him to run both races on weekends, so he did and the wins kept coming and the sponsors liked seeing their names on the tv for the whole race and it spiraled out of control and to this day he can't stay out of an xfinity car, his sponsors don't want him out of them. But hey, I'm on your side, I don't want any cup guys racing in xfinity. Look at Austin Dillon now. When he was in the Xfinity series he only won 2 races and he won a championship while winning no races that year in xfinity. He just raced for points and won the trophy. So Austin goes to Cup with 2 career wins in Xfinity, he can't win in his first 2 years in Cup so he starts running more xfinity races and has won 4 xfinity races during his first 2 years driving cup full time. And speaking of Jr's teams in Xfinity. He just hired a driver for this year strictly because he has a full time sponsor, Elliott Sadler. Elliott brings a lot of money to Jr's teams with his full time sponsor OneMain Financial. There was no reason for Jr to hire Elliott other than to get that money because Sadler was in cup for 16 years and only won THREE races, a lot like Martin Truex who also has only won 3 races in Cup. But "finally" Sadler was dropped from Cup and he started racing full time in xfinity back in 2011 because he had a good money sponsor behind him. In 168 races Sadler has only managed 5 wins in xfinity and no championships but as long as his sponsor keeps paying all that money to back him someone in the xfinity series will have a car for him no matter Sadlers on track results. I wholeheartedly agree with you saying team's do have a say in how the money is spent. And I disagree with those who say that NASCAR can't make a rule that keeps most Cup drivers out of Xfinity races. They could say that any driver with at least two full seasons of Cup experience, who is currently running for Cup points, can't race in Xfinity in the same year. This would allow Cup rookies to still race there, and will allow part-time older Cup drivers to go back and race there. Then, for the sponsors who don't have Cup size budgets, they will be able to sponsor Xfinity drivers who will actually be competing for wins and the exposure that comes with that. If a sponsor comes to JGR, for example, and wants to sponsor Denny for both Cup and NSX races, JGR could say, I'm sorry, but Denny doesn't race in NXS. For those races, you can sponsor our NXS driver, who has won ___ times this year and is currently leading the points, or something like that. Teams will never do this on their own, because of course potentially turning away money is not something they will do, if that sponsor can just go across the garage to another Cup affiliated NXS team and get a Cup driver. That is why NASCAR needs to step up and make the rule I described above. One other thing, I get tired of hearing the NASCAR media and other insiders tell fans they shouldn't complain about things like empty stand or short fields because it's just "business" and doesn't affect the "on-track product" we see, yet when we do complain about the "on-track product" such as Cup drivers in NXS making a boring product, well they just say we JUST don't understand the BUSINESS. I am thinking the turnover rate has been blazing since the Mid 1990s and not getting any easier in the Present Day XFinity Series. If we had legit double crown runners, it be different. But, I am just as floored why there is not a genuine commitment to better and safer venues that aren't in the carbon copies or not know what to do with being modern. So glad to see this article and I hope that more writers and fans express their views on this ridiculous situation. We no longer watch the NXS in its entirety ...we watch the beginning an maybe the last 25 to 50 laps in hope that a race breaks out before the checker falls. Our whole circle of friends are fans and either do the same thing or skip the races all together....what good is that to the sponsors....someone needs to do something about this before it totally collapses as a series. The driver who started the trend of running full-time Cup and 90 percent plus of the BuschFinityWide schedule was Kevin Harvick in the early 2000's ... Carl Edwards and Kyle Busch sort of solidified it.